Nuremberg, 15 Kipper-Kreuzer, mint mark: 3 ears of corn. 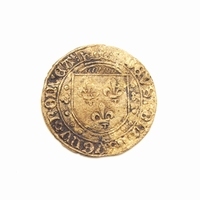 Obverse: Arms between 16 and 22, value K XV above. Reverse: Crowned double-headed eagle with arms on its breast.